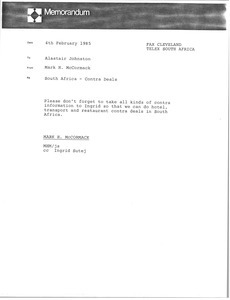 South Africa - McCormack informs Owen Williams that they are making plans for Andrew Maconie to spend two months in South Africa beginning in January. Maconie will be evaluating the South African market and making recommendations as to what sort of set-up they should have there. McCormack requests Williams' thoughts on the issues with the South African Market. 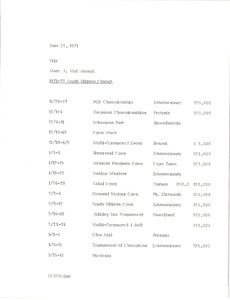 South Africa - Listing the 1971-1972 South Africa Circuit dates and tournaments. 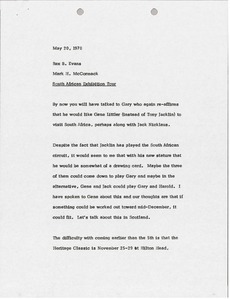 South Africa - Gary Player would like Gene Littler to visit South Africa instead of Tony Jacklin, perhaps along with Jack Nicklaus. 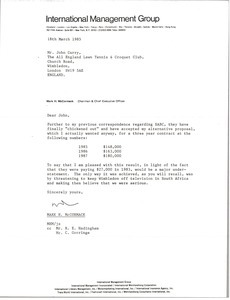 McCormack tries to figure out the best time to send the players to South Africa, but notes several scheduling difficulties. McCormack notes that he is anxiously awaiting the results of the CNA reaction to the Annual. 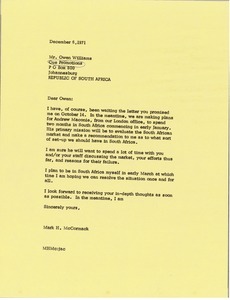 South Africa - McCormack has a creative idea with reference to South African television. 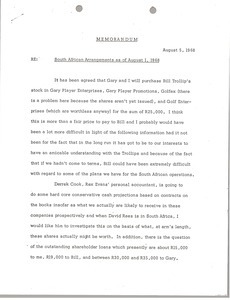 South Africa - Requesting contra information for contra deals in South Africa. 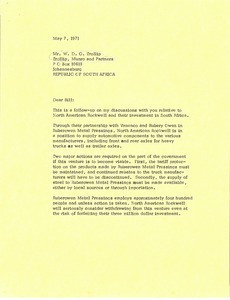 South Africa - McCormack follows up after their meeting concerning North American Rockwell and their investments in South Africa. 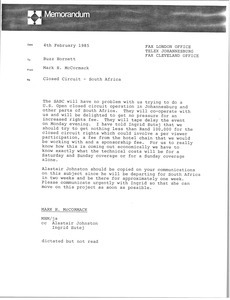 South Africa - McCormack outlines the proposal from SABC for 1985-1987. 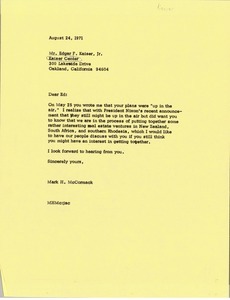 Letter from Mark H. McCormack to Edgar F. Kaiser Jr.
South Africa - Informing Kaiser that he is in the processing of putting together interesting real estate ventures in New Zealand, South Africa, and southern Rhodesia, which McCormack feels Kaiser may be interested in. 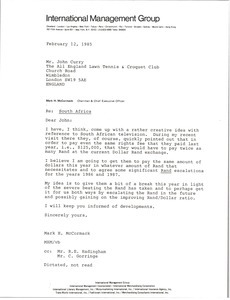 South Africa - Noting that the SABC won't have a problem with them trying to do a U. S. Open closed circuit operation in Johannesburg.